Let’s face it ladies, we are all super busy during the week. Just because I work from home many people assume I have all the time in the world to put exquisite meals on the table and obviously have a spotless house. Honestly, I would love to have both of them (especially the clean house), but I do the best I can, leaving me depending on the slow cooker many nights for dinner. While I have quite a few slow cooker cookbooks, I have gotten tired of cooking some of the same recipes over and over (or variations of the same chili recipes), leaving me looking for fresh, interesting recipes. Luckily, i recently found a fun new slow cooker cookbook that seemed perfect for my family – the 175 Essential Slow Cooker Classics Cookbook. Looking for a fun cookbook with recipes that entire family is sure to love? If so, we think you will enjoy Judith Finlayson’s latest cookbook – 175 Essential Slow Cooker Classics. This yummy cookbook is designed with the home cook in mind, allowing busy adults to make delicious recipes in their crock pot that range from ordinary to extraordinary in this easy to use, full color cookbook. This beautiful cookbook features some of her all time favorite three of her previous slow cook cookbooks and includes over 60 new recipes for those who already know and love her cookbooks. With easy to follow directions and a variety of delicious, family friendly recipes, everyone can find something to love in this classic cookbook! Honestly, I was wowed by many of the recipes in this cookbook. Not only are they super easy to make, but the pictures in the book are beautiful! It feels rare anymore to find a cookbook that is comfortable putting pictures of the food, especially slow cooker cookbooks. I mean, let’s be honest, most slow cooker recipes taste great but sometimes are far from…umm…visually appealing. This book does a great job of making the recipes look great and making you want to run and start putting the recipes together. I also love that it has a variety of vegetarian and vegan recipes, something I have had a hard time finding. Based on my own experience, I am happy to give the 175 Essential Slow Cooker Classics Cookbook an A rating! Want to purchase this yummy cookbook for yourself? 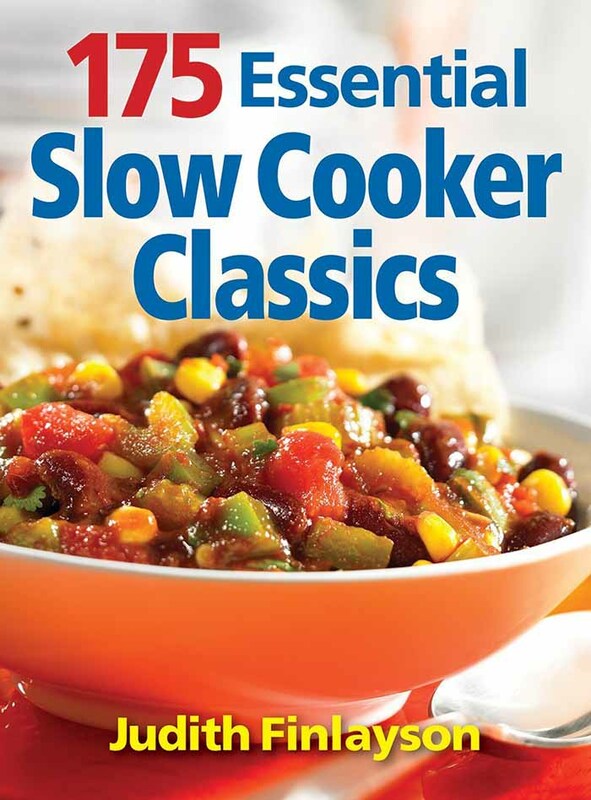 You can purchase the 175 Essential Slow Cooker Classics Cookbook by Judith Finlayson on Amazon.com for only $24.95. I will have to purchase this book for my cousin; she just got a place of her own and has been mentioning how much she is struggling with cooking healthy meals. I love cooking with my slowcooker. Great way to make a fabulous meal with the cheaper cuts of meat saving you some money on your grocery bill. I like using a slow cooker. It makes the meal pretty much fool proof. Just throw the ingredients in and forget it. That really seems like it would be a very valuable book around here during the Winter. I am a slow cooker nut when it’s cold. Especially when all the kids are on vacation. Such great recipes to cook for those chilly winter nights ! I absolutely love my slow cooker!! I am always looking for new recipes to try. Thank you for the heads up on this book! This looks like a fantastic book. I have a slow cooker, and have yet to make more than an occasional chilli or beef stew. I use my slow cooker all the time especially at this time of year and am always searching for recipes. Nice that the recipes are easy to follow and look good. I’ve been using my crockpot more this year but am still not sure what to make it in. This cookbook sounds exactly what I need! My slow cooker is my best friend in the kitchen and I’m always looking for new recipes to try. Slow cooker dinners are a must aorund my house as we both work. Winters are much warmer with slow cooker dinners and I want this cookbook for new recipes!! I am always looking for crockpot recipes! I love when cookbooks use great pictures of the recipes, and it is rare when it comes to slow-cooker recipes! I love my slow cooker!! Its so nice to prep everything during the morning and have it cook throughout the day!! I am totally running out of recipes so this book would be amazing for new and fresh ideas!! I need to use the slow cooker more often. I generally only make beef stroghanoff and chicken paprikash in the crock pot. You know, my mom never had a crock-pot/slow cooker even though she was a 1960s mom. I don’t think that she fully comprehended it, she also had a cook (don’t ask). I love these devices with an enduring love and love these compilations of knowledge about how to get the best out of them. So many great recipes! Thanks! I think slow cookers are the way to go especially with a lot of family easy and convenient. I love slow cooker recipes. I’ve been cooking a lot in my crockpot lately with the weather getting colder, it helps make my day easier. I’ve been looking for more recipes to add to my collection. I absolutely love me slow cooker. I have pinned tons of recipes and plan on making most of them this winter. Our family likes to use the slow cooker for busy days. Both kids play sports and nights can be hectic, but using the slow cooker means we don’t have to do takeout.